Sometimes Mondays are all about Tuesday. What?! Are you confused? Don’t be. Tuesday is the name of our daughter’s chocolate lab. No, Iris does not work in research at Hershey headquarters in Pennsylvania. No, she didn’t adopt her sweet puppy on a Tuesday afternoon, but we do celebrate Tuesdays as double days. They become Tuesday’s Tuesday. So here we are on Monday, and my grand-dogger and I went to the beach. What’s so special about that? Well, nothing really . . . yet everything! 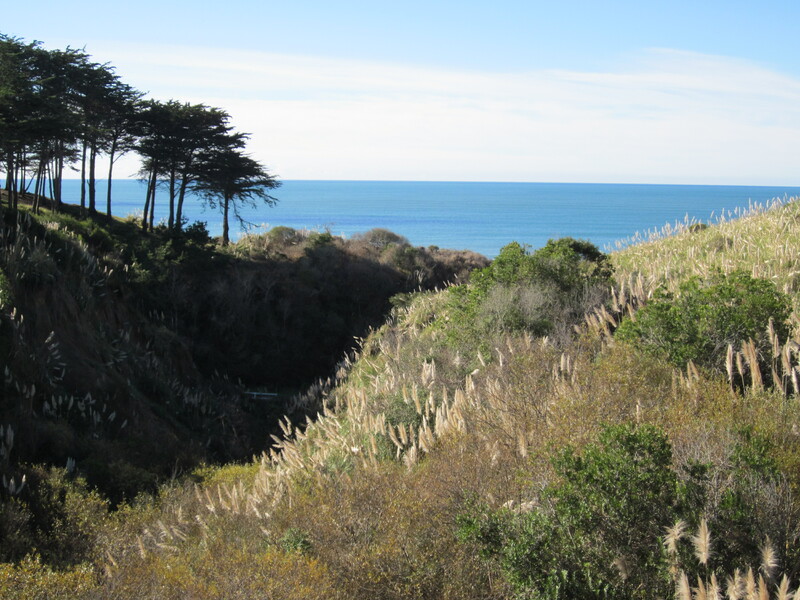 There’s a great spot just a hop, skip, and jump over the Santa Cruz mountains on the northern part of the Monterey Bay called Seascape. 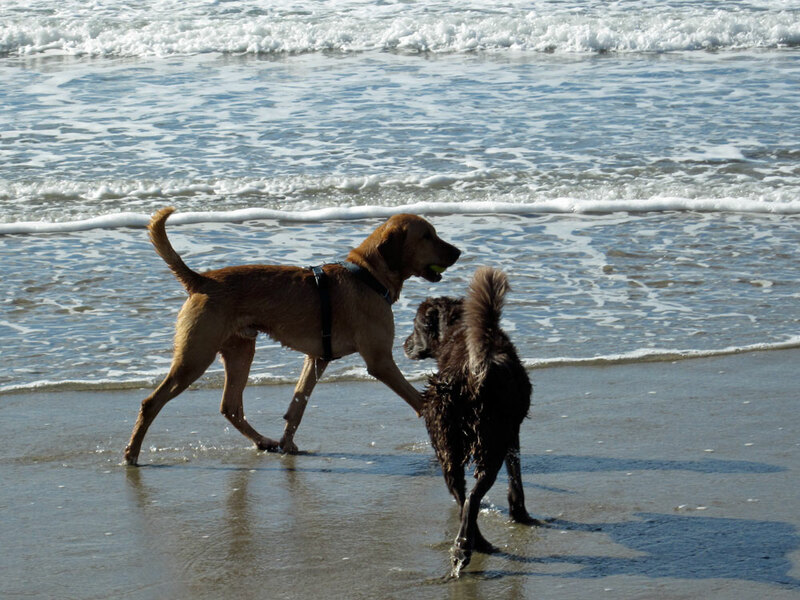 It’s a magnificent stretch of beach which happens to be dog-friendly and has become one of our favorite get-aways. It’s expansive and pristine as far as the eye can see. Drop into a place like that, especially on a weekday, and you pretty much have it all to yourself—except for a few other dog lovers, occasional joggers and surfers. 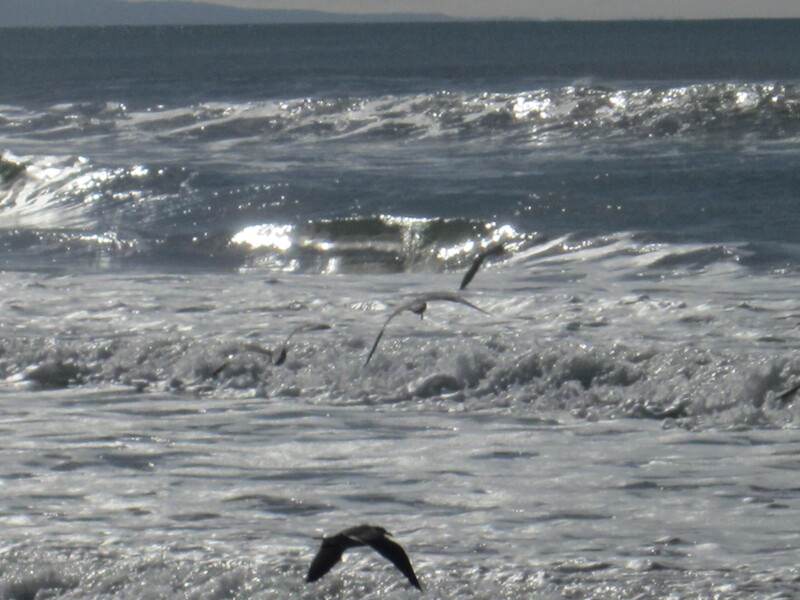 Today was overwhelmingly beautiful with full sun, crisp fresh air, blue skies and crashing winter waves. Perfect! Tuesday is like most other dogs. She absolutely loves to chase a tennis ball, even when said ball goes way out into the ocean. That just seems to make chasing it even more fun. I have no idea how long she would actually keep diving into the waves, in search of that bobbing ball, but her energy seems limitless. 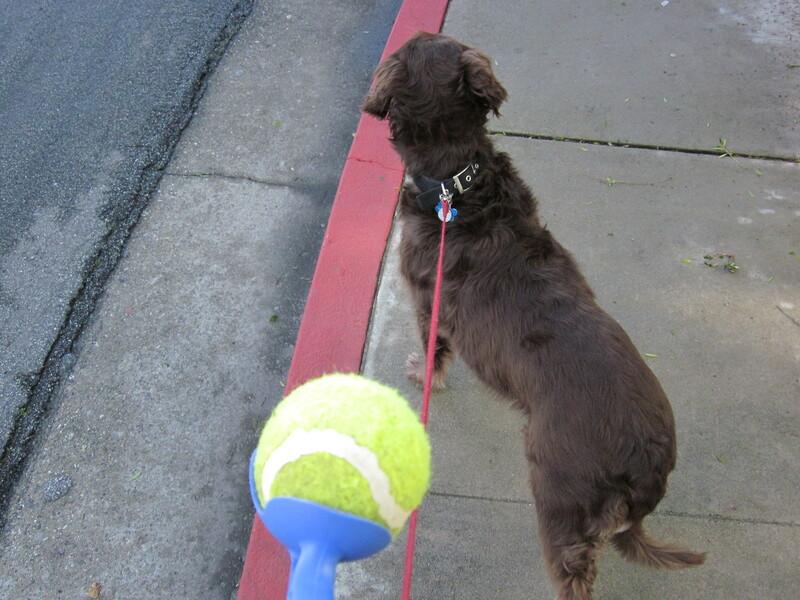 We arrived in style today with our blue plastic ball launcher, a bright green tennis ball, two doggie bags (just in case) and the camera. Within minutes, we were literally off and running. 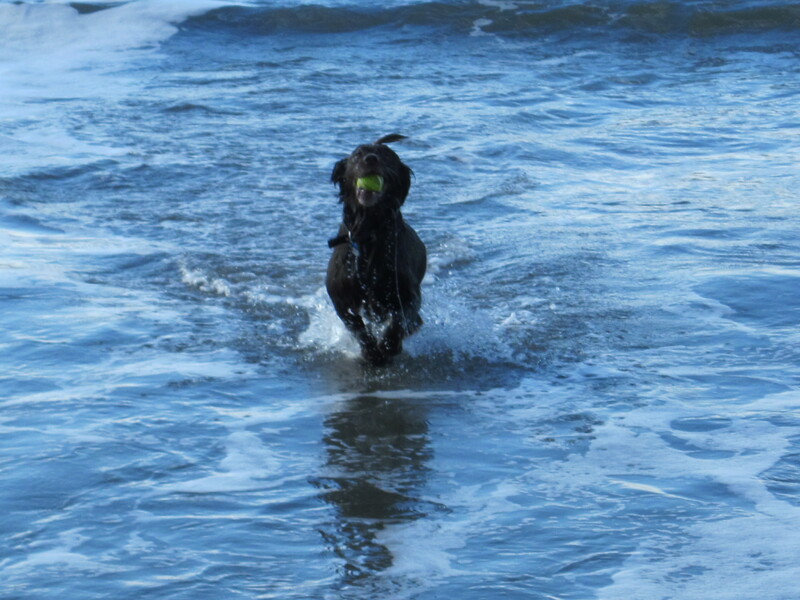 She could hardly wait for me to fling the tennis ball out into the deep blue sea, as she kept her eyes fixed on me, muscles tensed, ready to run. Tuesday is shy around other dogs, but still a social girl—she just needs more time than others to warm up to group games. When another dog runs up, she’s more than happy to back off and give them her ball if they want to use it for a while. If she was a person we would call her amiable, nice or even generous. In any case, she’s very easy to get along with, and I appreciate that about her. It makes our outings even better. One day we were walking along, minding our own business, and this unusual breed of bulldog, which I had never seen before, boldly strolled over to where we were playing. His name was Harvey. Without asking, he clamped his jaws around her new tennis ball and just stood there stoically holding it, as if daring someone to try and take it away. His owner seemed unusually distressed and started bemoaning the event. Harvey had evidently pulled that stunt before. The thing about Harvey that we quickly learned was . . . once he’s claimed a ball, he NEVER gives it back! In fact, he has such strong jaw muscles that the owner, together with his friend, tried to pry his mouth open to retrieve the ball, but to no avail. They couldn’t budge his mouth even a fraction of an inch. Harvey just stood his ground, or I should say clenched his teeth—possession being more than nine-tenths in Harvey’s Law. We said he could keep the ball, and his owner breathed a sigh of relief. Without giving it a second thought, Tuesday graciously went about finding new games to play. That’s just how she is. Today she played in the deepest waves and romped in the sand until my last over-zealous and fateful toss out to sea. For some strange reason the ball never came back. We waited a long time, but it never surfaced from the growling waves. Oh well. We had fun while it lasted. We decided to conclude our time at the beach by walking side by side, watching the birds and the surfers, as we slowly sauntered back to the car. On one hand, this story isn’t special at all. It’s a rather ordinary account of a man and a beloved pet playing on the beach. No big deal! But, on the other hand, it’s a timeless tale. It speaks to the simplicity of life—an everyday story about relationship, unconditional love and being in the moment, with nature. What more could you want? Our day at the beach served as a great reminder to stop and smell the roses (or the seaweed in this case) every once in a while. How lucky we are to have a great companion like Tuesday that makes such a day so effortless and delightful. After all, that’s what grand-doggers are for! 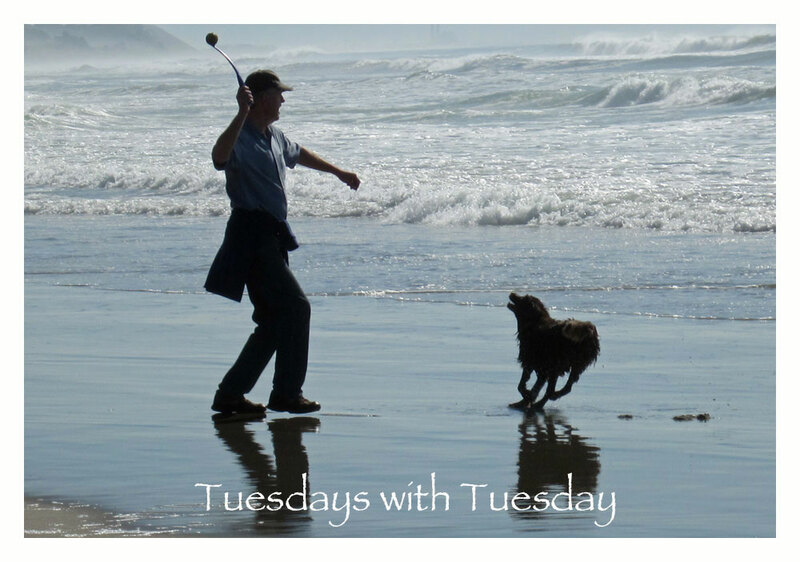 Note: As of 2015, our dear Tuesday is no longer with us. You might want to take a look at her picture with little Emelee asleep on her neck. The story is called “Emelee,” and the two of them were quite a duo.